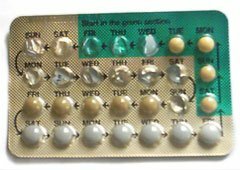 A 30-year Scandinavian study suggests that oral contraceptives may alleviate painful periods for some women. Estimates suggest more than half of women have suffered from the condition, called dysmenorrhoea, at some point. The Swedish study, reported in the journal Human Reproduction, found women on the pill reported slightly less severe period pains. Oral contraceptives are not currently officially licensed for this purpose. The researchers, from Sahlgrenska Academy at Gothenburg University, followed groups of hundreds of 19-year-olds, recruiting some in 1981, some in 1991, and the rest in 2001. Five years after an initial health questionnaire, the women were contacted again to see if anything had changed. While it was hard to quantify precisely this difference in pain levels, on average it represented a change from “severe” to “moderate” pain in every third woman in the group taking oral contraceptives. Dr. Ingela Lindh said that the impact of painful periods should not be underestimated. She said: “Painful periods occur frequently, particularly in young women where as many as 50% to 75% suffer from dysmenorrhoea. “It can have a detrimental effect on these women’s lives, causing regular absenteeism from school and work, and interfering with their daily activities for several days each month. One US survey suggested that the condition could cause 600 million lost working hours in the US each year. However, earlier efforts to detect any link between the pill and period pain had proved fruitless, with a 2009 Cochrane Review concluding there was limited evidence for pain improvement. At present, the European Medicines Agency, which oversees drug licensing across the EU, does not include the treatment of period pain as a licensed use for oral contraceptives. Dr. Ingela Lindh said that the new information from her study should be included in contraceptive counseling sessions.